Microsoft and Amazon are working together to bring a much richer digital assistant experience to their customers. They are doing this by making both digital assistants, intelligent friends. Taking the strengths of both assistants, interacting with each other and making them available on every device possible. we believe that assistants will work together each and every day to help us”. Microsoft believes the technology of the future is putting people at the center instead of devices. Explaining this as multiple devices interfaced in multiple locations with multiple people using multiple senses. An example of how this comes together is Cortana and Alexa’s new partnership in enriching lives. Microsoft showcased early stages of this development on stage at Build 2018. Take a look at this demo by Megan Saunders, Cortana GM and Tom Taylor SVP Amazon Alexa in this video. 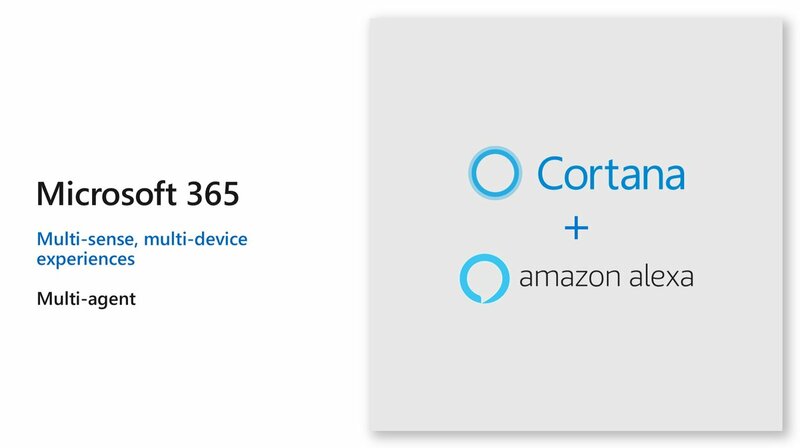 The Cortana Alexa partnership is still in a beta stage. If you’ll like to try it, Microsoft say visit https://aka.ms/cortana_alexa to be notified when it goes live. The vision for Microsoft with Cortana is to meet customers wherever they are and no matter the device. Also for developers Microsoft is promising building skills for Cortana and Alexa will enable access to more devices across devices. Excited about what partnering with other digital Assistants can and might bring or do? Surely it will be interesting to see Cortana, Alexa, Siri, Aura, Google all working together at a point.